I have been a Bell Canada employee since 1987. Working as a field technician in 905 area in Southern Ontario,my job title changed from an installer/repairman to CO technician to Cable Locater and finally to a Cable Repair Technician. I always had a love for collecting and have had sizable collection of baseball,hockey cards and other collectibles in the past. As recently as 2003, I started collecting older and antique desk sets and candlestick telephones. 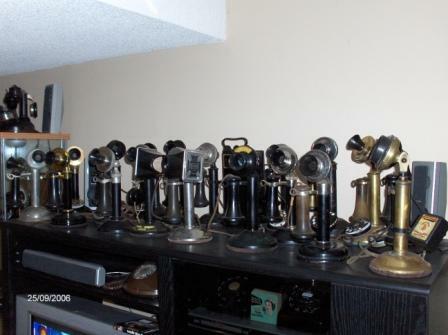 My telephones have been built into a sizable collection which includes candlesticks, wall phones and desk sets. Majority of the items in my collection are not fully restored,but I make every effort to keep them true to their original shape.I am always looking for odd, unusual or Canadiana telephones and paraphernalia. The above photo shows the top of my entertainment unit which houses some of my candlestick telephones.